blog.HalloweenAdventure.com | Latest News from the Costumes Trend FrontLines! : Easter is a'comin'! Halloween Adventure, we adore Easter. We loved it as children, hunting for eggs in our backyard, and we love it now. It's a happy holiday, whether you celebrate it religiously or in a more secular fashion. Not to mention it's an excellent opportunity to dress up! 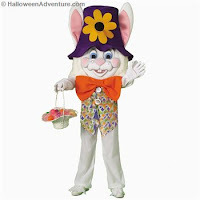 Take, for instance, this hilarious Adult Easter Bunny Costume. Perfect for the church party, the neighborhood party, or even just joking around with the kids, this realistic looking bunny costume is both cute and funny! It includes an oversized hat with attached ears and see-through eye mesh (in center of flower), plush poncho with attached face bunny face & bow tie, tunic with attached plush paw flaps and pants with attached plush paw flaps. We've also got an adult costume that's more bunny than funny. This one can double as a mascot costume - it's that realistic! This complete mascot costume includes: oversized character mascot head with terrific facial details & mesh eyes, plush body with attached tail and zipper in back, mitts, spats, and parade big feet. Oversized mascot heads are made of foam, lined in latex and covered with faux fur. The premium costume also comes in white. have one of those at home!